Yay! 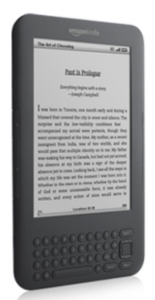 Amazon (NASDAQ:AMZN) listened to its customers, and has now added the Kindle 3G with Special offers to the Kindle family. I’ve seen a lot of comments about this on the Kindle reviews on Amazon’s site, and the Amazon Kindle Facebook page. Amazon is offering the 3G Kindle with special offers for $25 less at $164. It includes all of the perks of the Kindle 3G with the addition of sponsored screensavers and ads. When I was looking at the overview of the new Kindle, I noticed how much the battery life has improved. Three weeks with wireless on, and 2 months with it off. That is awesome. A couple of great special offers include: $10 for $20 Gift Card, and $100 with new Amazon Visa Card sign up. I wish I had that offer when I signed up for my Amazon Visa Card! These offers end June 4th and May 30th respectively. After Amazon’s announcement, there were complaints about how people have just bought the Kindle 3G. If you have bought a Kindle within the last 30 days, you may still send it back and get the newer special offers version. Now, is the Kindle DX next in line? On another note, it will be interesting to see how the tablets Amazon is supposedly working on will affect the Kindle DX. Wow, owners of the new Special Offers Kindle can gets some pretty sweet deals through Amazon (NASDAQ: Amazon). One of the current offers is, when you order select bestsellers or classics for your Kindle, you can get a $10 Amazon.com credit. The additional catch is that you have to use your Amazon visa card. Now I will say this, I recently got one, and have heard great things about it. You get points with your purchases, and can get extra points for purchases from Amazon. Once you accrue enough points, you can redeem them for amazon.com credit and many other goodies. So far, there haven’t been any annoying fees or promotions that most credit card companies push. Some of the bestsellers include the recent hit Water for Elephants, The Hunger Game series and Michael Lewis’s The Big Short. You’ll also find classics from old favorites such as Mark Twain, the Bronte sisters, and Lucy Maud Montgomery (Anne of Green Gables). Check out this page for a complete list of bestsellers and classics that you can choose from. The current offer goes until May 21st. Happy reading!